One of my co-worker came to me and asked if I can help her recover data from her external hard drive. I know how to recover the data which was deleted by accident or from a formatted hard drive. However, If the hard drive is really physically damaged or hardware failure, I can only say I will try my best. I shoot a lot of photos every week and I found the best way to protect my photos is by using RAID storage. What is RAID? I don't want to go into too much detail and the short answer is a RAID system uses more than one hard drive and even one hard drive fail, you still have your data well protected on the healthy one. 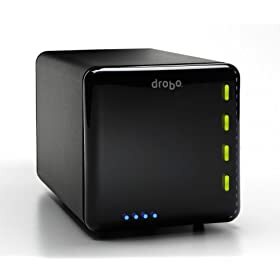 I had a chance to try different RAID Storage recently, and I found Drobo from Data Robotics is the most interesting one. It has a special function "Beyond RAID" which allows you to increase storage space by replacing bigger Hard Drive(s) while you don't even need to turn it off. If you want to know how it works in action, Amazon is so kind to put up a product video as well. Click the link below to watch it. There are other RAID storage that offers similar functions. But If you don't wanna get in to details with technology, get the Drobo, it will make your life easier. Who Should/Shouldn't Get a Netbook? Whats Make a Good Portraits Lens? Beginner: What lens should I get? Dell Mini 9 Evil Twins Vostro A90 $199!! Is Spring! Get a Macro Lens!